Fall has officially fallen and the weather is starting to reflect it. While we’ve had our fair share of beautiful sunny days this week, the mornings have a chill to them and it cools off more quickly in the evenings. So it’s time for autumn dinners to come out. I perused the bounty of winter squash at the market recently and decided to choose two variegated, acorn-shaped darlings. Now, acorn squash, with its deep ridges, is a right pain to peel and dice like one might a butternut squash or a pumpkin. So I don’t generally bother. When I have an acorn-shaped squash in my life, I stuff it. Some chopped aromatics, something to bulk it up, maybe a bit of green veg and some mushrooms, and then a topping of lots of cheese. It’s totally versatile, using grains or no grains, meat or no meat. The cheese on top could be substituted with any nicely-melting vegan cheeze. If you use a grain to bulk it, you can use a bit of cooked quinoa to keep it gluten-free. 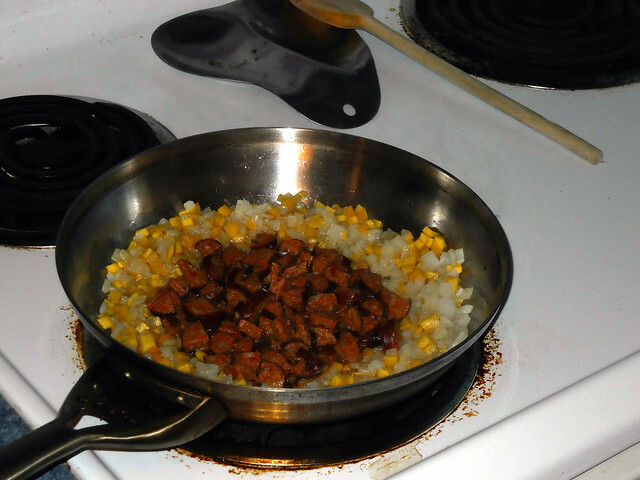 Or eliminate the grain altogether and add some ground meat or chopped sausage, as I did here. You don’t need much. I found a lonely Andouille sausage in the fridge that needed to be used up, so I included it in my topping instead of using oats or quinoa. Anyway, I hope you enjoy this recipe and consider adding it to your autumn cooking rotation! Preheat your oven to 375 degrees and line a baking sheet with parchment. Prepare your squash by either chopping in half along the equator and trimming the bottom of each half to sit flat, or by chopping the top 1/2-1″ off two smaller squashes and trimming their bottoms to sit flat. Scoop out the seeds. Turn them cavity-side-down and roast for about a half an hour, or until tender when poked with a fork. Chop the squash scraps and saute them with the onion over medium heat in a bit of oil or fat until they are tender and the onions start to go translucent. Add the diced sausage and allow to brown. Add the mushrooms and cook everything together until the mushrooms are cooked. Then, add the kale and turn off the heat, allowing the kale to wilt in the hot pan. Stir everything together. 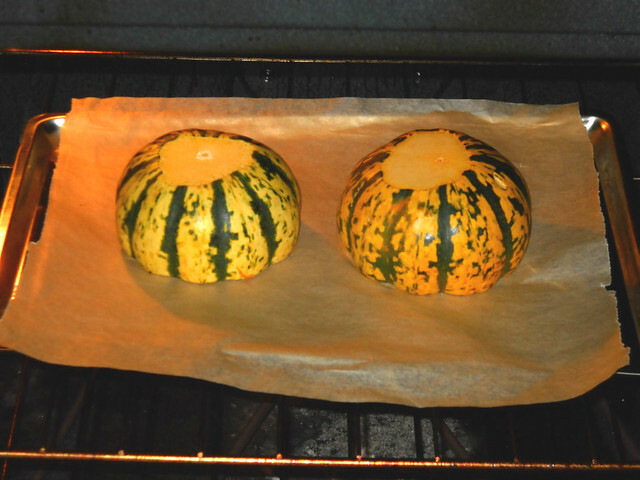 Remove the squash from the oven and turn cavity-side-up. Fill each squash cavity with the sausage mixture, patting it into the cavity and mounding it up a bit. Top with shredded cheese. 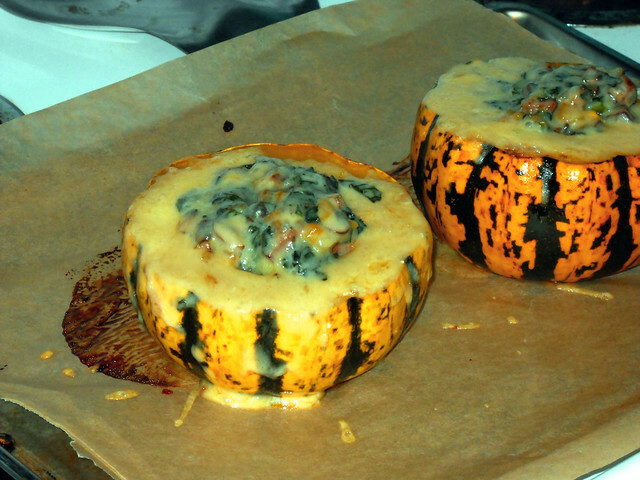 Return to the oven for 10-15 minutes, or until the cheese is bubbling and slightly browned. You can turn on the broiler for a few minutes to brown them, if you like. Makes two servings. I could happily live on dishes like this straight on ’til spring returns. Thank you for sharing this hearty, wonderful fall dish with us. I’m going to modify it a touch so that I can safely eat it and whip it up after our next trip to the farmer’s market, where squashes and pumpkins are out in full force this month. Thank you for the tasty share! That’s what I love about this dish: it is supremely modifiable. While I have plenty of friends and family with food restrictions, I thought of you in particular when I whipped it up! Thanks.